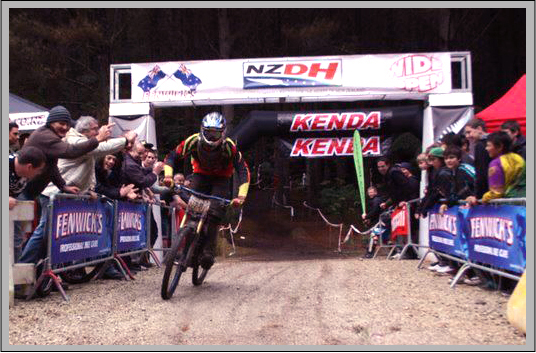 The 1st round of New Zealand’s Premier Downhill Championship Series took place at Descend Rotorua’s Whakarewarewa Forest – National Downhill Track this weekend. Saturday morning registration proved that the previous AKDH series has ramped up to National level status with an outstanding field of 132 registered race competitors for Round 1 of the NZDH 6 round series. Rotorua – Bay of Plenty has enjoyed a long spell of dry weather over the last 3 weeks of which brought superb race track conditions for the competitors to dial themselves in for Sunday’s race day. Track conditions were perfect though out the day with a slight drizzle mist managing to fall in between the trees to turn the track into a slick, fast and smooth road for the riders ahead. The practice day spectators were witnessing noticeable changes to different team colored competitors on new bikes which included an ever growing number of serious competitors mounted on the new Rotorua based designed Zeroed DH Race bikes. The younger Under 15 to 19 class riders were also displaying more speed from last summer’s Nationals and would be proving themselves to the times of the more senior classes over the weekend. The end of practice finished at 4.00pm sharp with most competitors managing to clock in 6 – 10 runs in preparation for tomorrow’s big race day. Morning Race day weather conditions started out with overcast cloud but with no threat of rain of which brought even more ideal track conditions than practice day. The Pro Elite riders were displaying some very fast riding of which was building up great excitement amongst the spectators waiting for the days racing to start. The 1st class of riders were the women’s field of two riders, followed by the masters men class who enjoyed the driest conditions for their race day competition. Sarah Atkin fresh home from competing on World level competition came through the finish with a race time that would place her equal with both U17 – 19 podium finish in the junior men’s classes. Next up was the youngest class of U15 riders who were the last of the riders that could enjoy the quickly deteriorating track conditions before the rain turned the race track into slick fast water flowing conditions. The U17-19 and Open men’s class were already up at the top of the mountain start line with their dry race tyre selection unable to make any changes for the worsening conditions. Descend Rotorua team of Jake Robinson, Louis and Conner Hamilton and not to forget an outstanding effort put in by AKDH newcomer Joe Jurlina. Open Men’s Carl Edmonson was in a class of his own dominating the large field of 30 riders by 14secs. The Pro Elite Riders managed to setup their race bikes before they all left on the shuttles to the top of the start line. Nelson’s Zeroed mounted Pro Elite Favorite Kieran Bennett found himself out gunned on his 1st run by local hero Matt Walker by a full 3 secs with the 1st two riders followed by Nathan Rankin and Bryn Dickinson by the slimist of margins. Almost 50% of the field of riders made a decision not to compete in the second timed runs due to the very unfavorable track conditions as the rain had now stopped falling, the track’s top soil was turning into glue. Under 15 Yeti NZ rider Matt Lawton managed to take the overall for his class over his main National Champion rival Jack Humphries. The Under 17 – 19 and Senior men class results could not be bettered with their 2nd runs, so the placing’s remained the same. The Pro Elite class favorite Kieran Bennett found himself in a precarious position if he wanted to come out on the top podium position with himself facing un-ideal race track conditions to try and beat Matt Walkers 1st run winning time. As the crowds of spectators lined up at the finish line to see what Kieran could achieve with these appalling conditions, were treated to witness the only rider that not only managed to put the fastest time down for the 2nd race runs, but to also stamp authority within the Pro Elite class with the fastest time of the day! An unbelievable result of which displayed huge determination and skill from Kieran to take out the Pro Elite class. Kieran confirmed with the race announcer that this was his toughest race run ever that he has competed in from his well recognized International MTB Downhill career. Overall, the organizers of the new, New Zealand Downhill series could not have hoped for a better start to their Premier MTB Downhill Championships. Fenwicks, Wide Open, Kenda Tyres and Hirepool nationwide for all their help and support to make this series possible. This entry was posted on Tuesday, September 20th, 2011 at 7:08 am and is filed under Uncategorized. You can follow any responses to this entry through the RSS 2.0 feed. Both comments and pings are currently closed.